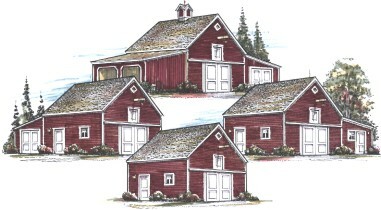 All of the designs in the Maple series of barns, garages, coach houses and workshops can be built from the same set of plans. You'll receive detailed construction drawings for an 18'x24' Main Garage/Barn with pull-down stairs to a 18'x24' Loft. You'll also receive plans for a variety of optional sheds that can extend the Main building on either side and across the back. Build an 18'x24' one-bay garage, barn or workshop now. Then add extra parking bays on the sides or across the back. Or, add an easy-to-build storage space, studio, greenhouse, potting shed, tractor shelter or woodshed. Or, add a shed across the back to extend your garage for big vehicles, boats or trailers. Build small now and then expand your building as your needs grow. Or, build exactly the layout you need right away. You can customize your building with your choice of layouts and your selection of exterior materials. Blueprints, by architect Don Berg, include all the drawings you'll need to build any of sixteen sample designs that are shown on those plans, or you can create your own custom building layout. Areas: Floor Area of Main Garage/Barn - 432 Sq.Ft., Floor Area of Storage Loft - 432 Sq.Ft. Doors: The sliding doors on the front of the Main Barn open 7'-6" wide and 8' high. The garage doors on the add-ons open 8' wide and 7' high. Overhead doors may be substituted for the sliding barn doors and hinged garage doors shown on the plans. Construction Cost: Post-frame (pole-barn) construction generally costs 20% less than conventional stud frame construction because continuous footings are not necessary and because site work is reduced. Built by a contractor, the Main Barn/Garage can cost from as little as $15,000 to more than $30,000 depending on your location, the season, your site, and your choice of materials and options. Add-on sheds can cost less than $3,000 for the smallest open shelter to over $12,000 for a 12'x24' garage and workshop. Material cost alone should be about half the range of these prices. Use your blueprints to get accurate estimates from contractors and building supply centers in your area. Order Now: Plans are $59.00 plus $5.00 for shipping, for three complete sets of drawings. The plans come with a complete money-back guarantee and include a variety of optional add-on sheds, shops, garages, greenhouses and carports that help you build any of sixteen standard layouts, including the one shown above. All sixteen of the standard layouts are shown on the plans you'll receive. You can build any of them, or you can use the main building plans and any of the add-ons to create your own custom design.